Christmas is soon here for ultra trail runners: UTMB 2017 registration starts Dec 15. "Enter the legend! 8000 runners from 5 continents. What about you?" Me? Yes! Who wouldn't want participate in the "Sommet Mondial du trail running". Let's visit ITRA to check if I have the required 15 points from 3 qualifying races. Yes, I do seem to have 6, 5, 4 and 4 "Endurance" points from my races in the past two years. Just ignore those "Mountain" points for now. So far, so good. 6+5+4=15 would buy me a lottery ticket. Let's now see if they are in UTMB's list of qualifying races, because "It will not be possible to register for the 2017 UTMB® by making reference to a race not included in this list." Got it. Damn, Ultra-Trail Collserola 2015 isn't listed anymore. I remember seeing it there before. The whole race with my 4 points has mysteriously disappeared! WTF? No panic, my other 4-pointer Ecotrail Oslo 2015 is there. We're cool. Also Swiss Irontrail 2015 is there with the 6 points for T201. I would have gotten the same amount of points by finishing the much shorter and easier T139 or T121. Surely 204.8km with +12,000m would be worth seven points, but six is the max they give for any race. Ok, whatever. So I have 4 + 6 = 10 points. 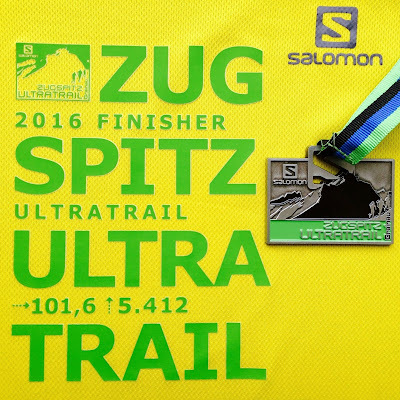 The remaining 5 points should come from Zugspitz Ultratrail 2016. 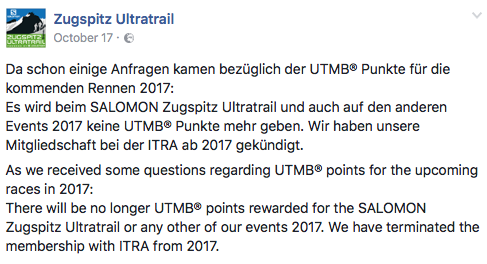 It is listed, but marked "To be checked" - meaning those points are not available, because UTMB apparently has some minor dispute with Plan B, who organize Zugspitz Ultratrail. Get over it! OMG! 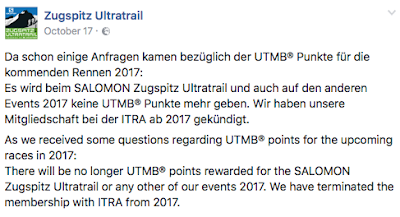 Zugspitz Ultratrail have announced that they have terminated their membership with ITRA and there will be no UTMB points available for any 2017 races. However when I chose Zugspitz Ultratrail it was advertised as UTMB-qualifier worth 5 points. Unfortunately that's not the case. Had they been honest about this, runners could have chosen another race. 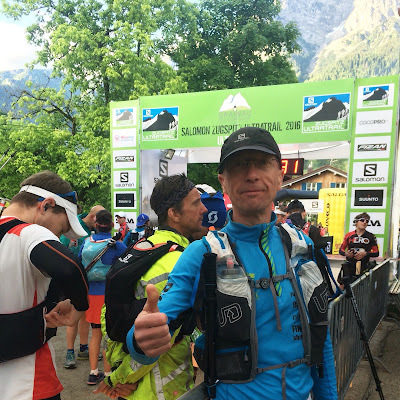 German blogger Trailfieber found out this disagreement is basically about Plan B's Zugspitz Ultratrail failing to respect UTMB's Ultra Trail brand. Meaning UTMB and other UTWT races would like to own everything in the world related to Ultra Trail. Good luck with that. I travelled across Europe with planes, trains and cars for those points. I spent my hard-earned cash on that trip. I ran all night in rain and mud to celebrate at the finish for those points. Take my finisher T-shirt and medal away, but give me those points you promised! So now when I'd like to use those points, they aren't valid - only because an ultra trail running race had included the words ultra trail in it's name? Good job, guys! Fortunately Swiss Irontrail 2017 doesn't have a lottery for T214 in July. I'm a trailrunner, not a trailgambler.